What can I do to prevent my dog being stolen? 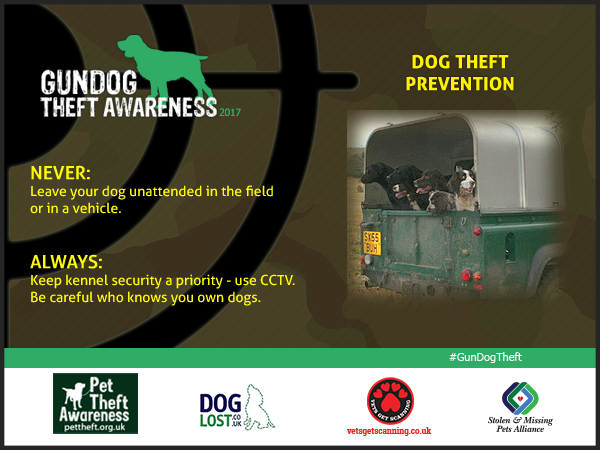 If you are on a shoot never leave your dog unattended and never leave it in a vehicle. If you are in the pub or in a public area don’t boast about your dog, you never know who is listening. If you are out walking, you can use tracking devices for your dog. Review your security. In your home make sure you have security locks on all windows and doors. Look at installing an alarm system in the house. Install security lighting and CCTV outside in the garden and if you have kennels or outbuildings ensure that have security lighting, CCTV and alarmed gates. NEVER leave ladders or tools around that can be used by thieves to gain entry. Are you having a litter of puppies? Remember your puppies have no identity. Don’t put signs by the roadside to indicate you have puppies for sale. Don’t tell everyone you have a litter and make sure you are not alone when strangers come to the door. If potential buyers come to see your puppies make sure you have someone with you and show them the puppies one by one. I am looking to buy a puppy, how can I be sure it’s not stolen? NEVER buy a dog from the boot of a car or off the internet or free ads paper. NEVER meet halfway or at a motorway service station to collect a dog and never have it delivered. ALWAYS buy from a responsible breeder and see the mother and if possible also the father. ALWAYS collect the puppy from the breeder’s home. ALWAYS have your puppies microchip checked asap after purchasing.